The lawyer you choose to represent you can make a difference in your life. Please choose carefully. There is no substitute for experience. Since 1983, George Francisco has stood up for the rights of people in Winston-Salem and throughout North Carolina. He is a board-certified civil trial specialist by the National Board of Trial Advocacy, as well as a board-certified specialist in workers’ compensation law by the North Carolina Bar’s Board of Legal Specialization. In fact, he was the first of only two lawyers in the state to hold both specialty certifications. Certification in these two specialties qualifies George Francisco to handle both personal injury and workers’ compensation cases, as well as complex catastrophic and serious injury cases involving personal injury and workers’ compensation. If you have been a victim of an accident caused by negligence, a work injury, an investment scheme, or unfair insurance practices, he can help. He will put his knowledge, dedication, and experience to work for you. Contact George Francisco at (336) 722-5088 to schedule a consultation about your personal injury, investment loss, or insurance case. Whether you have been hurt in an auto or work accident, a loved one has been scammed out of a large amount of money, or you have been denied an insurance claim, George Francisco is ready to work for you. When he designs a legal strategy, his goal is to maximize the value of your recovery. In many cases, that means going to trial. He has tried more than 100 personal injury and workers compensation cases to a final verdict. He is willing to devote all of his energy and resources to doing what is right for you. He is available to handle cases involving serious and catastrophic injuries, including brain, spine, and burn injuries, as well as wrongful death cases stemming from any type of accident. He will protect your rights in cases involving car accidents, truck accidents, and motorcycle accidents. He also represents people who have been hurt on the job in workers’ compensation and construction accident cases. George Francisco has extensive experience handling a wide range of insurance issues. Whether you have been denied a claim after an accident, or you are facing any other insurance dispute, he can help. 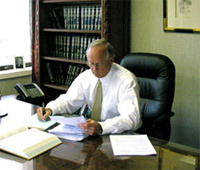 In addition to personal injury cases involving physical injuries, he handles cases involving financial injuries as well. As an investment loss attorney, he is here to represent people who have been the victim of any scheme or swindle that has caused them to lose large amounts of money. To learn more about what he can do for you, contact George Francisco at (336) 722-5088.